We have three award-winning eating establishments to choose from! We take pride in our restaurants and invite you to stop by and sample some of the best food in Lamar. We are conveniently located on 1301 North Main Street and open morning, noon and evening. Come in for a great lunch and/or dinner and find out what quality cooking really tastes like! Please click on one of the following restaurants to learn more about it and view our menus. Please keep in mind that our menus change from time to time and sometimes the menu on our website doesn’t reflect those changes immediately. Please give us a call if you have any questions. Take a break from the long day on the trail at Clementines restaurant. With award winning steaks and outstanding service, you won’t leave hungry or disappointed. What would the old west be without a Saloon. 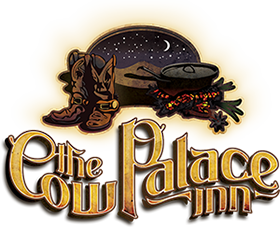 Take a break from the heat of the day and stop by The Branding Iron Saloon, right inside The Cow Palace Inn.